IMPORTANT – All tickets will arrive with Sunday 24th written along the top. If you have booked a Saturday ticket you should see that it says Saturday admission on the ticket. If you have booked Sunday tickets you will see it says Sunday admission on the ticket. Tickets are not interchangeable and you should only turn up on the day you have a ticket for. Pre-Sale tickets are £12 in advance plus booking fees (pre-sale finished 11/08/19) and are hard stock tickets only. Standard rate tickets are £20.00 from 12/02/19 and will be print at home tickets only. Additional tickets will be available on the day. You will receive an email regarding parking on Saturday once you have booked a ticket. IMPORTANT – Children under 14 years old are FREE with a full paying adult. Please email [email protected] with the number of children you’ll be bringing with you, so we can track numbers. GO Diving offers FREE parking during the Saturday and Sunday event days. Here’s the important bit! SATURDAY – Parking is limited to 1,000 spaces due to the Rugby so YOU MUST pre-book parking for this day. Once you have purchased a Saturday ticket you’ll receive an email from SeeTickets with parking instructions. If you drive to the venue without registering or all spaces are full you’ll need to park in an off-site car park (fees apply). Drive to the main gate of the venue and you’ll be directed into a nearby car park. SUNDAY – We have 2,000 parking spaces and there is no need to register. Parking is on a first come, first served basis. FRIDAY – Because this is a business event, parking is charged at the standard Ricoh Arena rates. You can also look to book off-site parking through a company like JustPark. 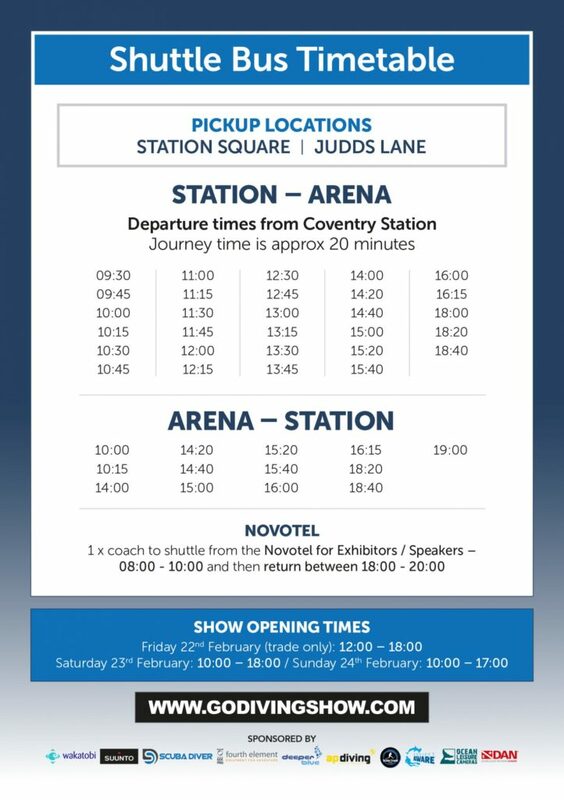 SATURDAY – There will be FOUR coaches running a shuttle service from Coventry Station to the Ricoh Arena. These coaches will be for all people going to the venue and there will be Ricoh staff at the station to help guide you to the right place. FRIDAY & SUNDAY – We’re not providing any additional coaches for Sunday. You’ll be able to grab the train direct to the Ricoh station or a taxi/bus from the front of the station. If you register you’ll get first opportunity at a pool session and these sessions are included in the ticket price. If you don’t register you can turn up on the day with swimwear and slot into a vacant time slot if we have any. Get all the latest information by following our social channels.